Went for 4 hours of Snowboarding @ Chill Factore, Manchester yesterday(15th December 2013) . Got a brilliant deal – £23 for 4 hours with snowboard & boots hire included. Got this deal through their members newsletter via a friend at work . I went with Greg & Liam who are far better than me in snowboarding. I was really nervous to go as I had not done snowboarding for a while. I was really worried whether I will be asked to leave the slope but I saw many others whom I think were far worse than me 🙂 I have been to Chill Factore earlier this year with my brother for a taster session – But that was just on the nursery slope. The equipments, lifts, quality of snow & slope were all better here compared to Swadlincote and Snowdome. Didn’t take the camera with me . So don’t have any photos or videos of me snowboarding(rather falling) . Including some photos from the net . It’s far better than these photos in my opinion. Took it easy as I wanted to enjoy and go home happy.. Didn’t try any more experiments. Snowboarding in real snow is far better. Can gain speeds and also control and stop when required. I am not sure if I will ever go back to dry slopes again. How do they make the snow? The snow is made from compressed air and water, which are blasted into a chilled atmosphere. On hitting the freezing air temperature snowflakes are formed. This process takes place every night producing a fresh covering of 5mm ready for snow buddies the next day. Fact: It snows every night in Manchester! The composition of real and artificially produced snowflakes is the same; the physical difference can only be spotted under a microscope. However whereas real snowflakes take hours to form, artificially produced real snow takes just seconds, meaning everyone can enjoy the amazing slope all year round. 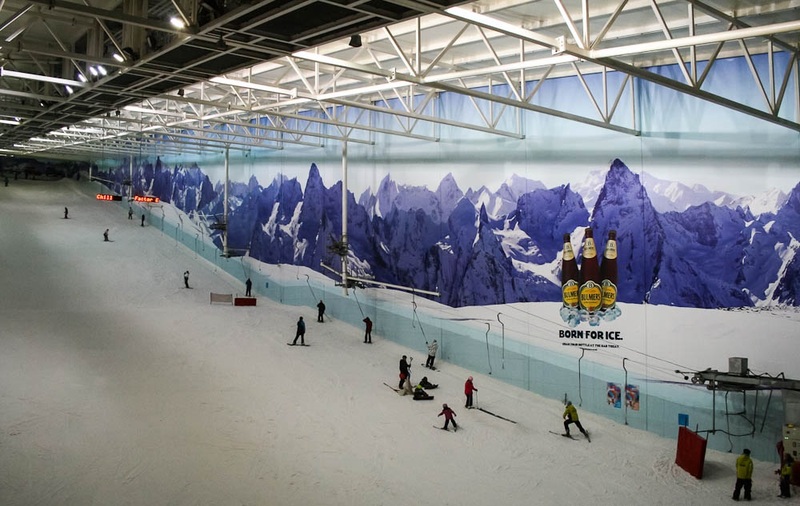 Chill Factore boasts the UK’s longest real snow indoor ski slope at 180 metres. The height of the building is 45m. The main slope starts at 40m at the top widening to 100m at the bottom. The area covered by snow is 10,200 sq m. This equates to around 1,632 tonnes of snow, based on a snow depth of 40cm. The compacted snow density is 0.4 tonnes per cubic metre. An average of sixteen tonnes of snow is produced per day. 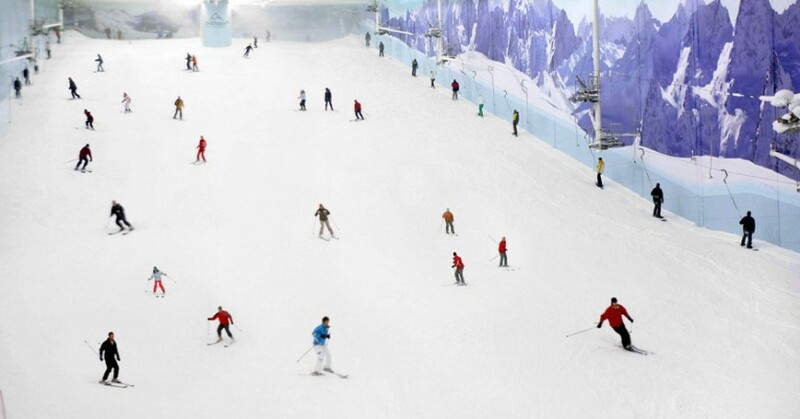 The indoor temperature is a steady –1.5 degrees C.
Maximum capacity on the main slope is 180 people. 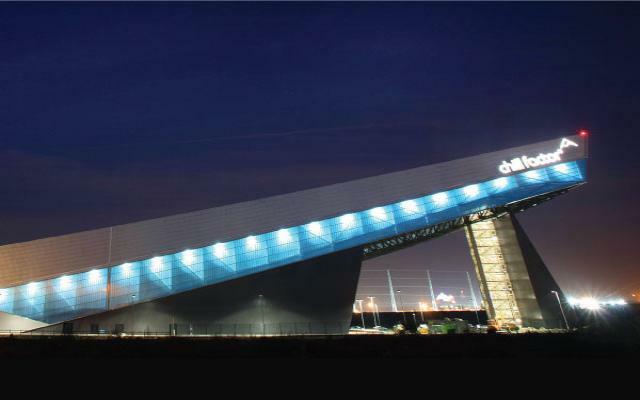 More than 500 jobs have been created at Chill Factore with around 260 people employed in the ski section alone. 2010 winner of Manchester Tourism ‘Access for All’ Award.